The British Government is declassifying UFO documents. But do they tell the whole story? Last week, amid much media fanfare, the British government declassified another batch of UFO-related documents—the sixth such release in recent years—in response to ongoing public interest in the phenomenon. UK journalism professor Dr. David Clarke is a consultant to that country’s National Archives and has more or less set himself up as an expert on what this, and the previous document-releases, tell us about the British government’s knowledge of UFOs. 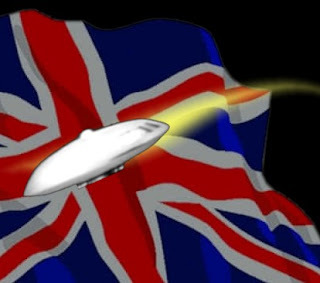 Well, Dr. Clarke may believe that the British government is being totally open on the subject of UFOs but many others, including myself, have strong doubts. A case in point is the U.S. Air Force’s closure of Project Blue Book in 1969. The project’s termination, and the eventual declassification of its files in 1974-75, left the impression—as was intended—that the military had lost interest in UFOs and was making public the sum of its knowledge about them. In reality, as U.S. Freedom of Information Act requests eventually proved, other groups within the Air Force, and other government agencies—including the CIA and the National Security Agency—had also collected information on UFOs for decades, especially in cases where the national security of the United States was potentially impacted. Many of those highly-secret cases—involving ongoing UFO incursions at nuclear missile sites and nuclear weapons storage depots—had been kept from public view long after the U.S. government supposedly came clean on its knowledge of UFOs. Importantly, at least one nukes-related UFO incident occurred in the UK , at the American-run RAF Bentwaters airbase, in December 1980, something that has yet to be officially acknowledged by the British (or American) government. To illustrate my point that information relating to the “really sensitive” cases was still being kept secret—despite all of the hoopla surrounding the latest document-release by the British government—I then mentioned that the former Deputy Base Commander at RAF Bentwaters, now-retired USAF Col. Charles Halt, is on-the-record regarding his having witnessed a disc-shaped UFO hovering near the base’s nuclear Weapons Storage Area (WSA), at which time the unknown craft sent down beams of light into or near the facility. No official record of that event has ever been declassified, by either the U.S. or British government. The real "spin" is actually coming from the other direction - from the people who are actively engaged in spreading the idea that there is “really sensitive material classified—and unacknowledged” about alien visitations that the government is with-holding for inexplicable reasons. It is impossible to disprove the existence of “really sensitive material” about UFOs that is being with-held. And there are people within the UFO industry who recognise this and realise they can keep repeating this claim indefinitely because no one can ever disprove it. As I've argued on my blog, if such material existed, why hasn't someone sent it to Wikileaks? I'd make a substantial wager that no one will leak it because it doesn't exist. As noted in my last post, the former Deputy Base Commander at RAF Bentwaters, now-retired USAF Colonel Charles Halt, is on-the-record as saying that one of the intelligently-controlled UFOs he witnessed, in December 1980, had sent down beams of light into the base’s nuclear Weapons Storage Area (WSA). If such a thing did indeed occur—regardless of the origin of those aboard the “elliptical-shaped” craft—would not such a provocative action be considered aggressive (warlike) with appropriate measures being taken by the officials involved—to suppress news of the incident? More to the point, would not official communications about the event been generated and shared between various groups within both the U.S. and British government? David Clarke claims that because neither the U.S. Department of Defense nor the British Ministry of Defence has released such paperwork (nor are likely to) it simply does not exist. Waters’ testimony is corroborated, at least to some degree, by others who were directly or indirectly aware of the UFO’s presence near the WSA. In fact, there is a strong suggestion that the UFO appeared near the facility on at least two nights during the week between Christmas and New Years Eve. Those tape-recorded statements may be found in my book’s chapter “Beams of Light” the link to which appeared in my last post. Both Barker and Carey estimated that the object covered 120 miles in 8-12 seconds, based on the 60-mile tracking radius of their “Bright 2” radar scope. Importantly, it should be noted that the incident at the Bentwaters WSA was hardly unique. Over the years, I have secured witness testimony from several former/retired USAF personnel, including one squadron commander, which supports the reality of UFO incursions at WSAs at several U.S. Air Force bases, as early as 1949—at Killeen Base, Texas—and as recently as 2004—at Nellis AFB’s Area 2. These sources’ verbatim statements may be found in my book, although I would be happy to post them on this forum. In short, the type of incident that Col. Halt witnessed at the Bentwaters Weapons Storage Area, although bizarre, has also been observed in the U.S. and the former Soviet Union , on many occasions. These were obviously important events, having no prosaic explanation, which would have been discussed in classified communications. The fact that those documents have not yet been released to the public, with rare exceptions, changes nothing. But some journalists will never get it, no matter how much data is placed before them. Rather than actually seeking out and interviewing the UFO sighting witnesses in these cases, to attempt to learn the facts, they will instead wait patiently for carefully-selected hand-outs from the government—in whatever country—which they will then use to form their opinion about what has or has not occurred behind the scenes. Unfortunately, many people will fall for these “expert” opinions and go on their merry way, none the wiser about the reality of the situation. As retired USAF Lt. Colonel Robert Peisher once told me, “Most people just want to keep everything on an even keel and live happily ever after by not investigating the unusual.” Peisher was the commander of the helicopter unit at Malmstrom AFB, Montana , in 1975. In 2004, he confirmed to me that his crews had once chased a UFO away from the base’s Weapons Storage Area. The silent and extremely bright craft eluded the choppers by racing to the nearby town of Belt , leaving the pursuers far behind, before looping back to the base and again hovering over the WSA. And guess what, Dr. Clarke, no documents about the incident have ever been declassified by the U.S. Air Force. So, I guess it never took place, right? Too bad the good colonel didn't have a Folklore specialist on his staff, to explain to him what really happened. Clarke isn't a straight shooter. When you provide him something that bolsters his claims, he thanks you effusively. Post something contradictory and it never sees the light of day. I speak from experience. feel free to add the this message to the comments or as a continuation of the article there. "My own rebuttal—which UK_UFO.org has refused to post—follows here:..."
Posting of your message titled "Re: [ufologyinuk] National Archives release UFO files"
So it was not rejected out of hand, but due to your unwillingness or incapability to comply with the list protocols and not for the first time I might add. "END OF MY ATTEMPTED POSTING ON UFO_UK.ORG"
went on to include about 40 lines of text and line feeds which were unnecessary. failure to even identify the web address of the site do not inspire confidence in the accuracy or objectivity of your research. If you want to complain about list protocols, please ensure that you are familiar with and willing/able to comply with the posting protocols before shooting your mouth off to a third party. I have downloaded all these files, there is so good stuff in them. Ok so yes they may be keeping some stuff under wraps, but as an Ex-Serviceman I fully understand that, there, however, is no big conspiracy within the halls of the UK Government. Just a wee correction, it is Lt.Colonel Charles HOLT not Halt. Sure someone else would correct you. This is how he spells it on his report for the Rendlesham Forest incident. Ok so yes they may be keeping some stuff under wraps, but as an Ex-Serviceman I fully understand that, there, however, is no big conspiracy within the halls of the UK Government. The noun conspiracy implies "concerted nefarious intent" and that isn't Robert's argument (as "I" interpret it), although some may view keeping information about "nuts 'n' bolts UFOs" and their pilots from the public a dubious action, the MoD's argument, as is that of the U.S. government and or military is anything that falls under the purview of "National Security" will not be released into the public domain. There are many reasons for this; one being not to share things i.e., intelligence and or intelligence practices with our enemies. The UK and USA are commensurate re the frame work for National Security matters, as well as intelligence; accordingly, you are correct and in agreement with Robert when you write about, "keeping some stuff under wraps . . .."
Thank you for the kind words re our site. I do apologize, on everything I seen relating to it, it was spelt with an O. I stand corrected and might nothing malicious by it. I may agree with keeping some things under wraps but shouldn't that be a given? Would we want to know about things that could in fact put people in danger? Secrets do come out in the end, but until the 'crisis' is passed they must remain secret. P.S. keep up the great work, you're an inspiration to folks like myself.